Here are some of Facebook CEO Mark Zuckerberg’s claims, as well as some claims from the lawmakers, which are fact-checked. Mark Zuckerberg, Facebook’s chief executive, is testifying before Congress on Tuesday and Wednesday to answer questions about the social network’s failure to protect the data of millions of its users and its role in Russian interference in the 2016 presidential election. Here are some of Zuckerberg’s claims, as well as some claims from the lawmakers, which we fact checked. Fed up with Facebook? Here’s how to break it off. How easy is it to #DeleteFacebook? We asked and you told us. Here’s advice from those who have disconnected. Cambridge Analytica, a political data firm, used information harvested from as many as 87 million Facebook users several years ago to build psychological profiles of voters. Facebook did announce changes in 2014 to limit the access that developers would have to data about Facebook users, but they did not take effect until 2015. Facebook has long maintained that it did not learn about how Russian agents had used its platform to influence the presidential election until the summer of 2017. While Alex Stamos, Facebook’s chief information officer, warned the company that Russian hackers may have been active on the platform in the summer of 2016, he has said he was looking at cybersecurity breaches, not disinformation campaigns tied to the elections. Tuesday was the first time that Zuckerberg cited 2016 as the date when the company identified new operations linked to the election. Facebook requires people to register for accounts with their real names. But the fact is that fake accounts and false pages have persisted on the social network. Russian agents set up accounts on Facebook with false identities before the 2016 presidential election. And just this week, Facebook removed a popular Black Lives Matter page after it was discovered to be inauthentic. Former employees of Cambridge Analytica have told The New York Times that they were using Facebook as early as 2014. Zuckerberg later said he had misspoken. 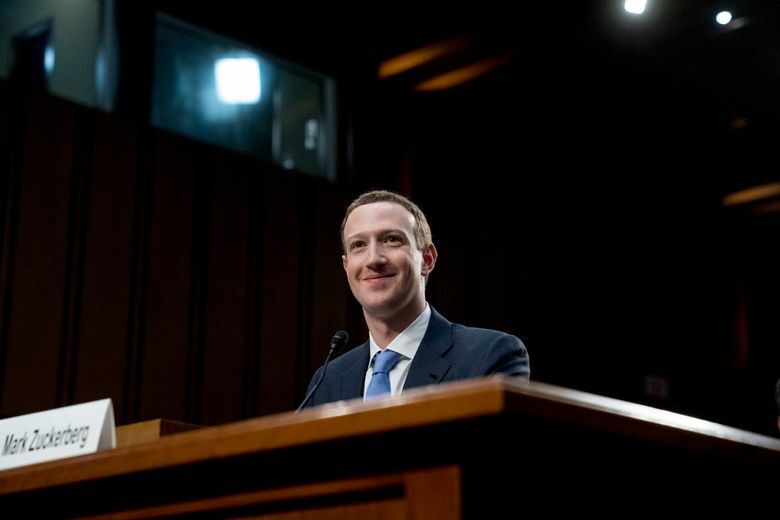 During the hearing, Zuckerberg was shown the terms of service of the quiz app that Alexander Kogan, a Russian-American academic, used to gather data from Facebook users. The fine print may have told users their data could be used for commercial purposes, according to a draft of the app’s terms of service that was reviewed by The Times, and which was shown to Zuckerberg by Sen. Richard Blumenthal, D-Conn. In other words, it appears that Facebook may not have regularly checked to make sure that apps complied with its rules. The final wording of the terms of service for Kogan’s app is now most likely unknowable. Facebook executives said they deleted the app in December 2015 after they found out about the data harvesting. More than 1 million people downloaded the 2012 Obama campaign’s app, which gained access to the data of supporters and their friends. Facebook users who downloaded the Obama campaign app were aware of its aims: supporting and campaigning for a political candidate. Those who downloaded the app from Kogan, however, believed they were taking a personality quiz for academic purposes and did not know that their data would end up in the hands of Cambridge Analytica. How successful Facebook has been at finding and eliminating terrorist propaganda from its platform is still up for debate. Facebook and other social media companies were chastised by the British Parliament in a 2017 report for “failing to remove illegal content when asked to do so — including dangerous terrorist recruitment material, promotion of sexual abuse of children and incitement to racial hatred.” The report called the companies’ lack of enforcement shameful. Last week, the Counter Extremism Project, a nonprofit that combats extremist groups, also said it had found accounts of some extremists that remained active on Facebook. A former Facebook employee told Gizmodo in 2016 that people working at the social network prevented stories about right-wing conferences and candidates from trending on Facebook. Other former employees disputed this suggestion and Gizmodo said it was “unable to determine if left-wing news topics or sources were similarly suppressed.” Facebook denied the allegations at the time, but the episode underscored the question of whether the social network was a media entity. While Facebook recently introduced a tool that allows people to download data that Facebook has collected on them, the tool appears to be incomplete. Some people have noticed that some data are missing, such as a long-forgotten feature of Facebook that lets you “poke” people. Facebook now allows users to opt-out of certain categories of data, including deciding what is shared with advertisers. But certain basic data will always be shared with the company unless a Facebook account is permanently deleted by the user.